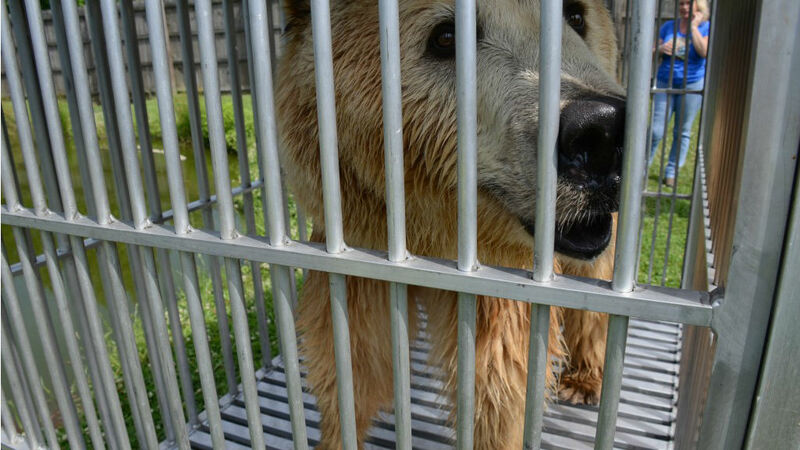 Four captive-bred bears that spent their early years as roadside tourist attractions in North Carolina then were confined to a back yard were on their way Sunday to an exotic animal sanctuary in Alpine. 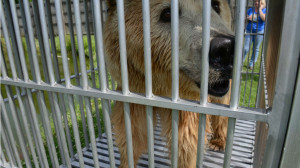 A silvertip grizzly bear is one of four captive-bred bears on its way to a new home at an exotic animal sanctuary in Apline. Photo credit: Lions, Tigers and Bears Sanctuary website. The East County rescue team from Lions, Tigers and Bears picked up two silvertip grizzlies, named Albert and Cherry Bomb, and two Himalayan black bears, called Teddy and Baloo. They had been caged at a home near Watha, North Carolina. the four bears began their 2,500 mile-plus journey Saturday, according to the organization. Albert and Cherry Bomb were born at Cherokee Bear Park, a roadside zoo, and were displayed in concrete pits and were used as cubs as props for kids to have their pictures taken. A lawsuit against the park alleging it violated the federal Endangered Species Protection Act was filed last December, according to Lions, Tigers and Bears. Teddy and Baloo were born at Tote-em-in Zoo, and lived under similar conditions, officials with the rescue organization said. They were eventually auctioned off and ended up with private owners who then turned them over to the rescue organization because they were no longer able to properly care for them, officials said. All four bears had had their claws removed and had not received proper medical care for years, according to the rescue organization. Lions, Tigers and Bears personnel loaded each bear into transfer cages, which were then placed into an air conditioned exotic animal hauler with running water Friday afternoon. The bears rested overnight and were examined by a veterinarian before they hit the road Saturday. The team stopped in Arkansas Saturday night, and were continuing their journey west today. The bears and the rescue team are expected to arrive at Lions, Tigers and Bears, 24402 Martin Way in Alpine, sometime Wednesday.